Police have released surveillance video and are seeking the public’s help in identifying a suspect in connection with the brazen shooting of two people inside a house on Lefferts Avenue last week. A man and a woman were shot inside a house on Lefferts Avenue on Sunday, June 17, and police have been investigating the incident since. This morning police have released surveillance video of a suspect they are seeking to identify in connection with the shooting. 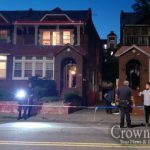 Following the shooting witnesses said that two or possibly three people walked up to the front door of 669 Lefferts Avenue and opened fire and striking two people inside, then fleeing the area. 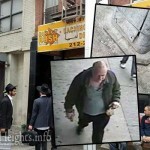 One of them was observed wearing a “do-rag”. EMS rushed the victims to a nearby hospital where they were being treated for their wounds, and are expected to survive. The shooting occurred just outside the Beis Eliyahu Nochum synagogue where evening prayer services were taking place. Two People Shot Inside House on Lefferts Ave.
Today is a primary election day. Our representative, Yvette Clarke, is running for re-election. Another Crown Heights website has up an article praising her for this and that, and urging people to vote for her. Not a word about her support of the ruinous Iran deal or her slurs against Israel, and in fact a comment of mine to that effect remained unpublished. Apparently the folks who run that website think that we are to be like mushrooms – kept in the dark and fed garbage. And we wonder why our elected officials don’t care? Same here!!! They did not publish my comment against voting for her due to her signature on the disgusting letter against Israel. they wont publish many comments since they aren’t a news site they are a paid advisements site claiming to be a news sits. for sale at the highest price.